Anatolia was home to some of the earliest farming communities. It has been long debated whether a migration of farming groups introduced agriculture to central Anatolia. Here, we report the first genome-wide data from a 15,000-year-old Anatolian hunter-gatherer and from seven Anatolian and Levantine early farmers. We find high genetic continuity (~80–90%) between the hunter-gatherers and early farmers of Anatolia and detect two distinct incoming ancestries: an early Iranian/Caucasus related one and a later one linked to the ancient Levant. Finally, we observe a genetic link between southern Europe and the Near East predating 15,000 years ago. Our results suggest a limited role of human migration in the emergence of agriculture in central Anatolia. In turn, the Iron Gates HG could be modeled without any Basal Eurasian ancestry or with a non-significant proportion of 1.6 ± 2.8% when forced to have it as a third source (Fig. 3b and Supplementary Table 10). In contrast to the above direct estimate, the three-way admixture model of WHG + EHG + AHG predicts α = 6.4 ± 1.9% for Iron Gates, calculated as (% AHG in Iron Gates HG) × (α in AHG), suggesting that unidirectional gene flow from the Near East to Europe alone may not be sufficient to explain the excess affinity between the Iron Gates HG and the Near-Eastern hunter-gatherers. Thus, it is plausible to assume that prior to 15,000 years ago there was either a bidirectional gene flow between populations ancestral to Southeastern Europeans of the early Holocene and those ancestral to Anatolians of the Late Glacial or a genetic influx from the populations ancestral to Southeastern Europeans into the Near East. Epigravettian expansion into MENA? I just speculated here and here about how IMO this is much more likely than geneflow in the opposite direction. 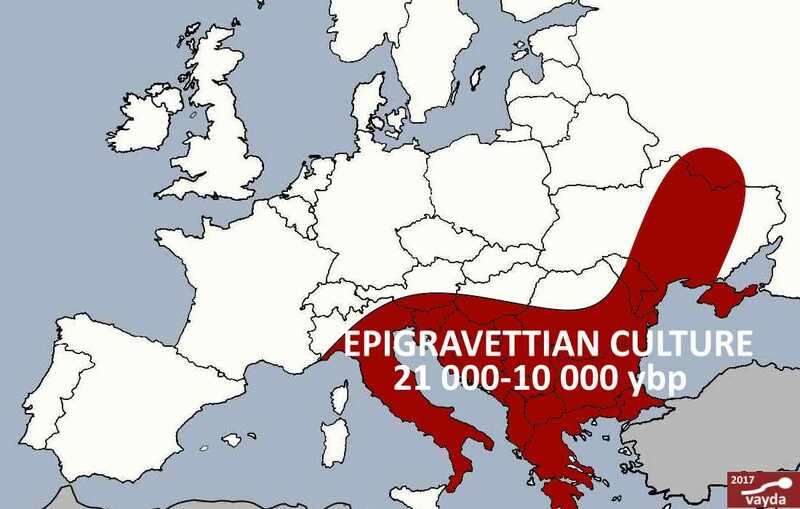 Could the onset of LGM ~26kya have driven Epigravettians to more temperate hunting grounds? We find an adequate two-way admixture model (χ2p = 0.158), in which AHG derives around half of his ancestry from a Neolithic Levantine-related gene pool (48.0 ± 4.5%; estimate ± 1 SE) and the rest from the WHG-related one (Supplementary Tables 4, 5). While these results do not suggest that the AHG gene pool originated as a mixture of Levant_N and WHG, both of which lived millennia later than AHG, it still robustly supports that AHG is genetically intermediate between WHG and Levant_N. This cannot be explained without gene flow between the ancestral gene pools of those three groups. This supports a late Pleistocene presence of both Near-Eastern and European hunter-gatherer-related ancestries in central Anatolia. Notably, this genetic link with the Levant pre-dates the advent of farming in this region by at least five millennia. Pretty much what i claimed on the CHL Levant paper. The Levant was dominated by an Anatolian-like (AHG without WHG) people before the arrival of the Mushabians. Levant_CHL were a remnant from this people rather than a later migration from Anatolia. Last edited by Piquerobi; 03-19-2019 at 07:11 PM. The results reinforce the assumption that the Anatolian Farmers were chiefly a mixture between a Dzudzuana-like and an Iron Gates HG-like source. Unsurprisingly, the Anatolian HG seems to be somewhat closer to Boncuklu than to Barcin. Last edited by Agamemnon; 03-19-2019 at 08:31 PM. No mtDNA H haplotypes. Anatolia and Levant have not yielded as much mtDNA H as was previously foreseen. Z-scores aren't significant for Onge, New Guinea, Bantu or Wambo. Last edited by IronHorse; 03-19-2019 at 10:31 PM.